Without realizing it at the time, his years of baseball and traveling would have an impact on Fred’s next venture. Baseball teams traveled in style and stayed at the best hotels. A slogan he saw along the way stuck in his head – “Perpetually New”. 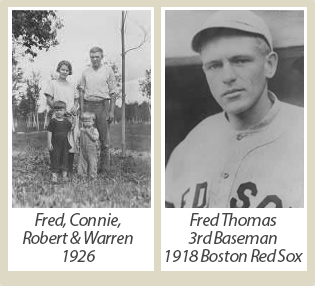 By 1924, Fred was married and had two small sons. He knew his days playing baseball were coming to an end. Fred longed to be in the northwoods and had already purchased land on Lake Chetac. One has to stop and ponder why Fred’s wife, Connie, with a 1 year old child and an infant, would leave a life of comfort in southern Wisconsin and end up at the end of a dirt path in a one room shack with no running water or electricity? Like Fred, Connie had a pioneer spirit and was ready for a new adventure. With the help of his father’s building crew, Fred and Connie were open for business by the summer of 1925. 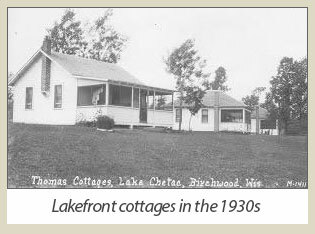 The classic (and true) Thomas family story is that the lumber to build the cottages had been brought up the lake by barge from Birchwood. A forest fire broke out and threatened to destroy their dream. Connie tied her toddler sons Robert and Warren to the legs of the high chair and fought along side the men to save the lumber. While it was Fred’s idea to build a resort, as is often the case, there is an incredible woman who makes it possible. Connie was the original energizer bunny. She worked from dawn to midnight doing woman’s and man’s work. It may have been the wilderness, but Fred and Connie were determined that their guests were going to experience a first class resort. The guests at the Fred Thomas Resort quickly had electricity when the Thomases installed a Kohler power plant. While other resorts in the area offered bare walls and an outhouse, guests at the Fred Thomas Resort had cottages with finished interiors, running water, showers and ice boxes. One of Fred’s best inspirations was the addition of a covered boathouse, a novel idea at the time. From its beginning in the early 30’s, the boathouse has been one of the most appreciated and valuable additions. 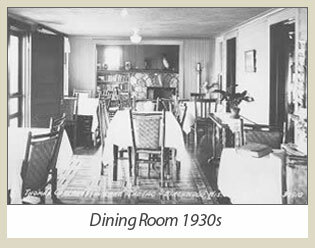 Until World War II, the resort offered the American Plan with Connie running a much praised and popular dining room. 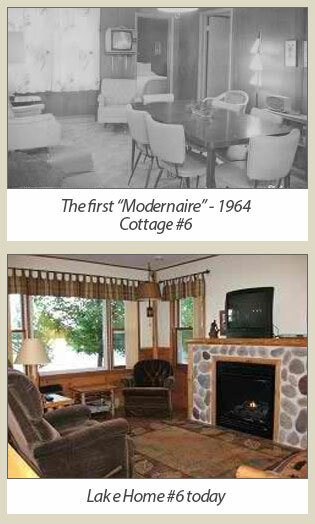 When Fred and Connie retired in 1958, the resort numbered 17 modern cottages. Son Warren, wife Verena and 4 young daughters (Christine, Linda, Julie, & Anita) would be the 2nd generation. The resort slogan “Perpetually New” was well embedded in Warren. 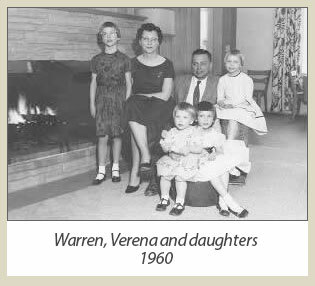 In 1963, Warren and Verena went against the advice from family, friends, resort guests and accountants. They chose to go with their instincts and stay true to the slogan of “Perpetually New”. They gutted and remodeled a cottage, offering modern conveniences of the day. Their risk with the new “Modernaire” cottage was a huge success and proved what they knew – fishing resort or not, people want the best. For the next 25 years, Warren and Verena forged ahead completely remodeling all the cottages and adding all new furniture, TVs, carpeting, and screened porches – amenities thought to be frivolous at the time. The resort numbered 21 units in 1987 when the 3rd generation came on board. Two of Warren and Verena’s daughters, Linda and Julie, along with Linda’s husband Bob, their 5 sons (Mark, Dan, Scott, Ted & Aaron) would carry on the legacy. The 3rd generation continues to remodel and upgrade the Lake Homes while keeping pace with current trends. Two TVs, 2nd bathrooms and dishwashers are standard in most every unit. 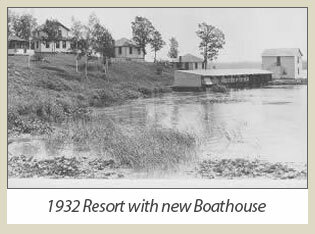 The Fred Thomas Resort was the first resort on the lake to offer air conditioning, laundry facilities, an exercise room, cement boat launch ramp and wireless internet. A constant effort is made to look for ways to make each guest’s vacation relaxing and memorable. Vacationers enjoy more than exceptional facilities and immaculately maintained grounds when choosing to vacation at a family owned resort. It is the intangible that makes your vacation experience truly special. It is the feeling of warmth and hospitality, that unique place in your heart when you know you have come home. We invite you to come join our resort family for a memorable Up North vacation where friendly, caring attention shines daily.